Hedgehogs are one of the most adorable creatures in the universe, don’t you think? 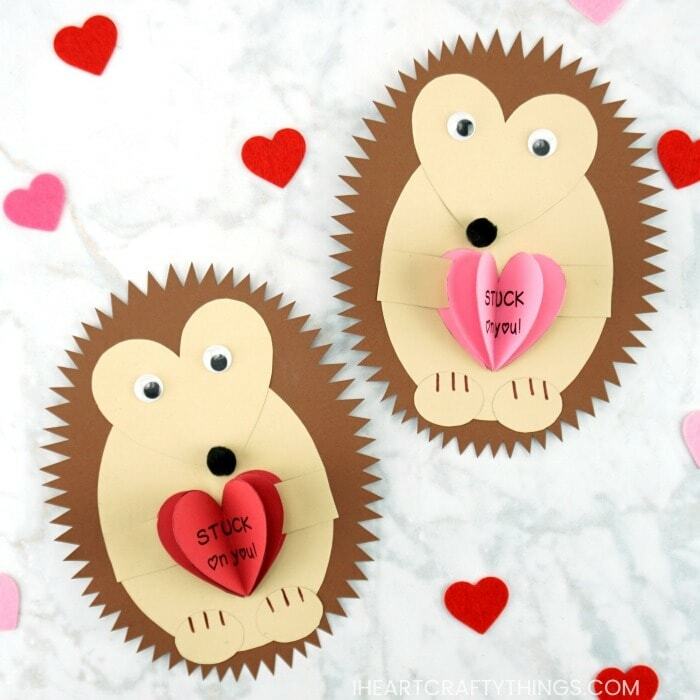 If you love them as much as I do, you are going to adore this hedgehog Valentine craft we are sharing with you today. 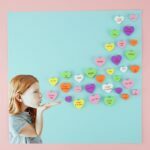 It is really easy to create and the added touch of the 3D heart with the saying “STUCK on you!” makes it a super sweet Valentine card to give to family or friends. 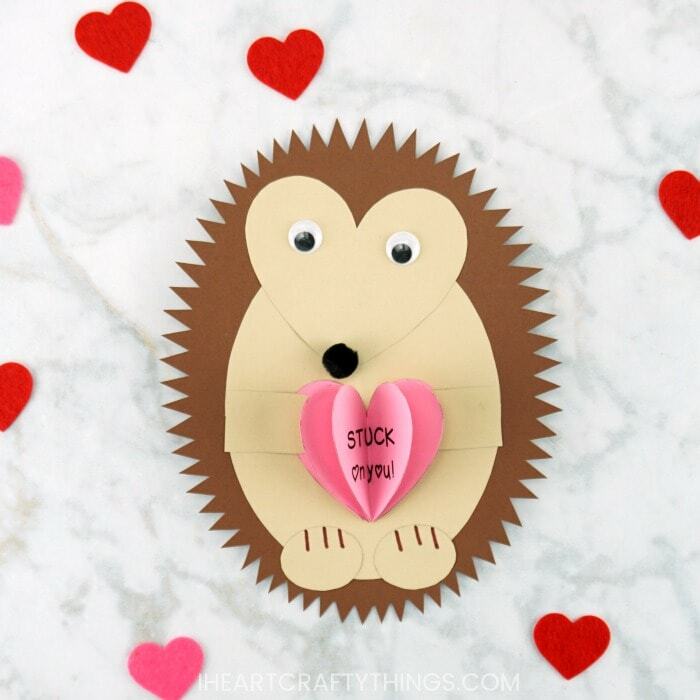 In this post, learn how to make this adorable hedgehog Valentine craft with our helpful template, step-by-step tutorial and video. 1. 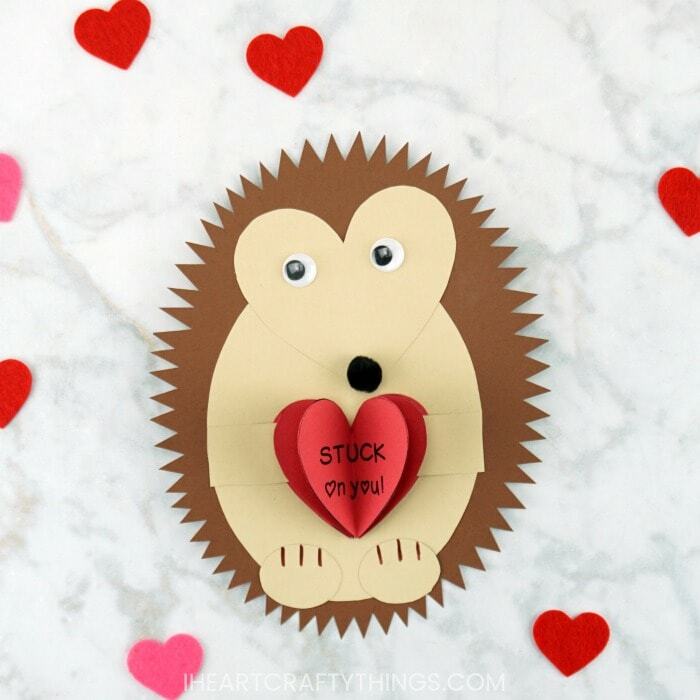 Begin by downloading and printing out our hedgehog Valentine craft template. 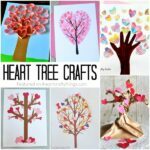 Print out the first page on brown cardstock, the second page on cream cardstock and the third heart page on red or pink cardstock (or the color of your choice). 2. 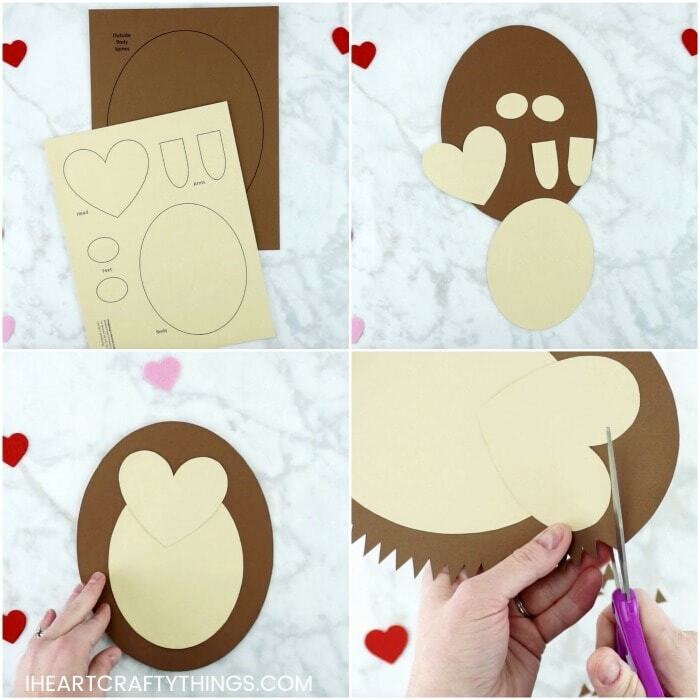 Cut out the different pieces of the hedgehog template on the brown and cream cardstock. 3. Glue the hedgehog body on the inside of the hedgehog body spines (the large, brown oval). Then glue the heart shaped hedgehog face at the top of the hedgehog body. 4. Use your scissors to begin cutting out small triangles around the edge of the hedgehog to create the hedgehog spines. Continue cutting out triangles around the entire perimeter of your hedgehog craft. 6. Use your glue stick to add glue to one of the blank folded heart halves. Then glue another blank heart half onto it. 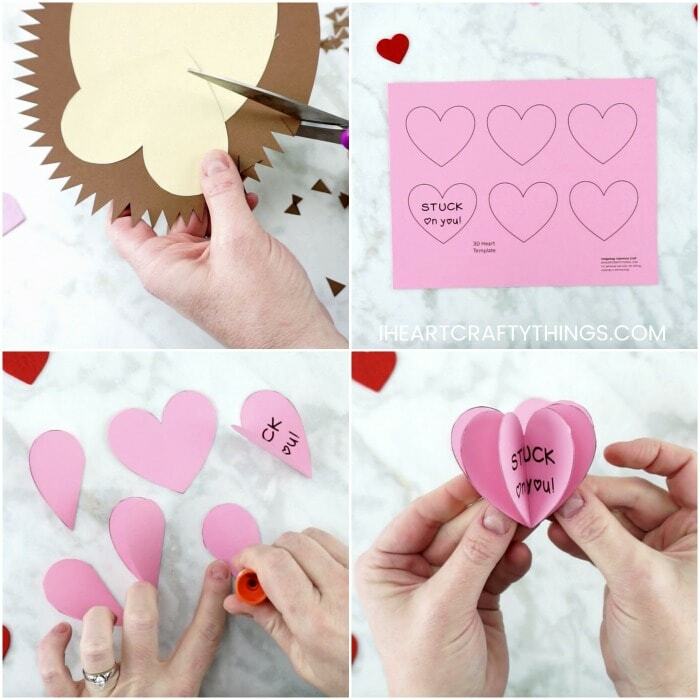 Next add glue to one half of the paper heart that says “STUCK on you!” and glue it onto the other hearts. 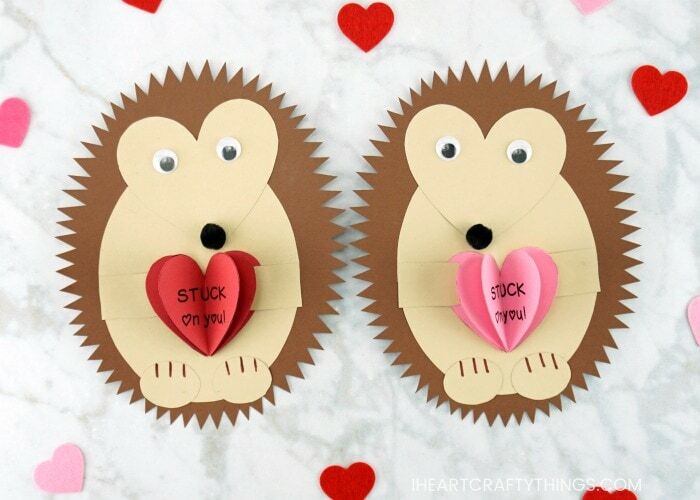 Continue adding glue and adding the two remaining blank paper hearts, creating a 3D heart to attach to your hedgehog Valentine craft. 7. Glue a small black pom at the bottom tip of the heart shaped hedgehog craft. Then glue googly eyes onto your hedgehog. 8. Glue the two oval shaped feet at the bottom of your hedgehog. Then glue the unfolded remaining heart in the middle of your hedgehog. This helps you glue the 3D heart onto your hedgehog. 9. 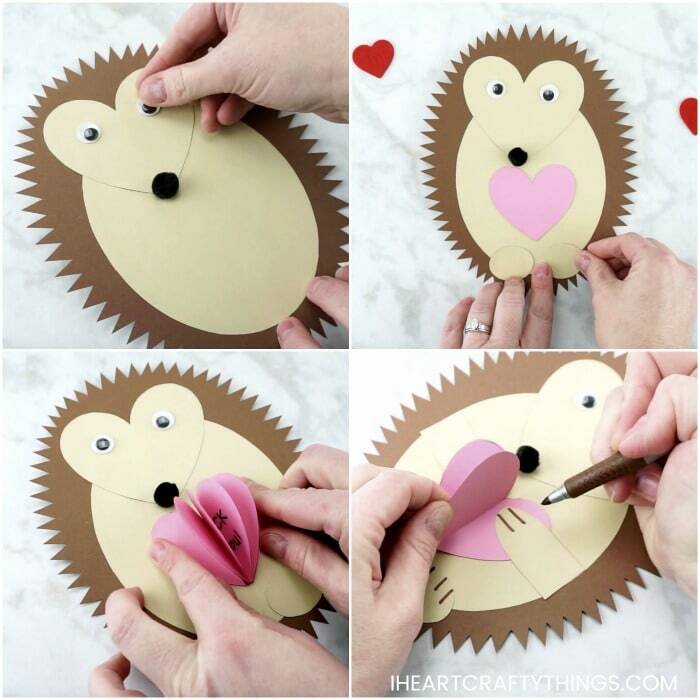 Add glue to the heart in the center of the hedgehog and then line up and glue the 3D heart onto it. 10. Glue the two hedgehog arms on your hedgehog with the arms laying inside the first flap of the 3D heart. This helps it look like the hedgehog is holding onto the 3D heart. 11. 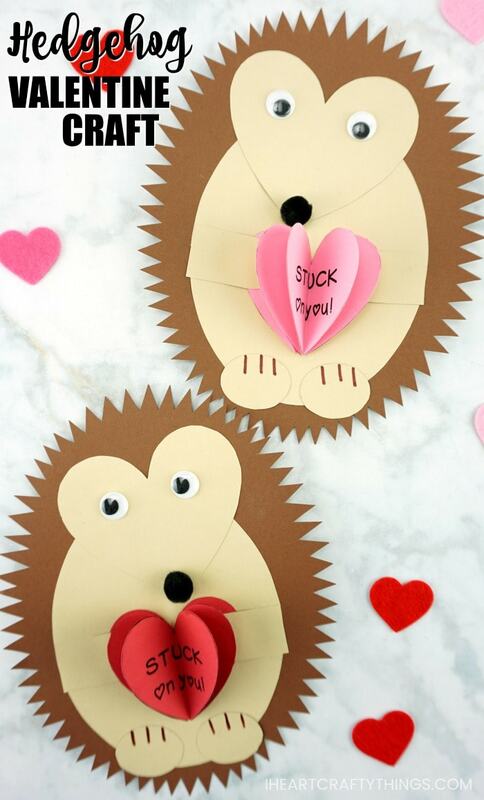 Use a brown marker to draw toes and fingers on the feet and hands of your hedgehog Valentine Craft. Aren’t these sweet little hedgehogs adorable?! If you are working with younger children, it might be a good idea to omit the 3D heart in the middle of the hedgehog and simply glue a single paper heart in the center for the hedgehog to hold on to. You could also let children write their own message on a blank heart to add to their hedgehog. If you love the 3D heart aspect of our hedgehog craft, you’ll also love this 3D Hot Air Balloon Card. We have a free template for this craft too making it super easy to create. 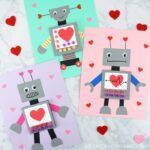 This Robot Valentine Craft is one of our favorites! Kids can use their creativity to design a robot around our free robot Valentine card template.